Chameleons are known for many of their unique qualities including their sticky projectile tongues, their eyes that move independently from each other, and possibly the most fascinating of them all, their ability to change the color of their skin. But how do they change colors? Can they match any surrounding? And why do they change colors? The ability to morph into your surroundings has been attempted by humans for years and often mimicked by hunters, military, and teenagers sneaking out of the house. But few have the abilities that our beloved chameleons possess. They don't have just one camouflage pattern, but they can change and adapt to their environments by utilizing their extremely special skin cells. Television commercials, shows, and movies claim that chameleons can magically change their skin colors to match whatever they are standing on almost instantly. But while there is some truth to this magic, chameleons have limitations to the colors they can become and cannot match just anything. Greens and browns are the predominant colors of chameleons, and these shades help them camouflage into their environments. Black is another color that you will see on chameleons, especially on their throats, and some chameleons use this color to show they are threatened. Some species of chameleons can turn more vibrant colors such as pink, red, blue, turquoise, or yellow. Panther chameleon and Madagascar chameleon species are some that are known to be extremely colorful and are also some of the most photographed kinds. 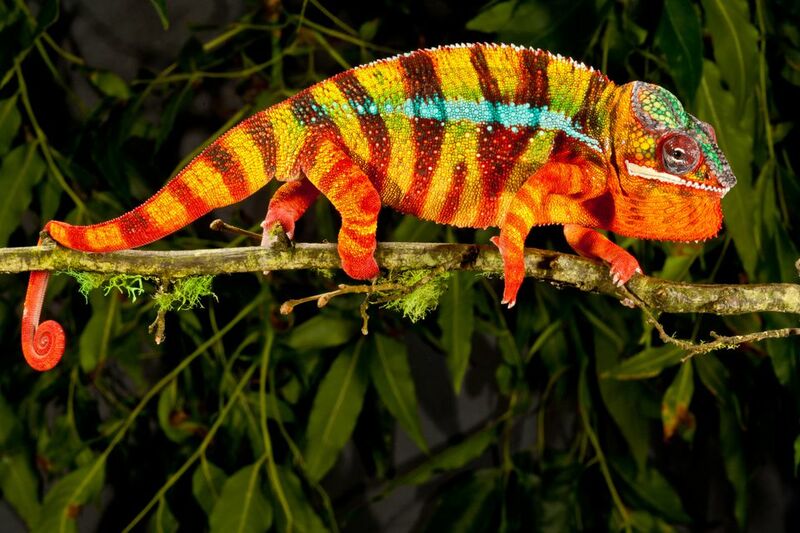 How Does a Chameleon Change Colors? Until recently, no one fully understood exactly how chameleons changed their colors. We now know that chameleons change their color by adjusting microscopic cells within their skin to reflect light differently. These cells are called iridophore cells, and they contain tiny crystals called nanocrystals. Nanocrystals of different sizes that are arranged in different shapes and groupings cause light to be reflected in different ways making the skin of chameleons change colors, similar to how a crystal hanging in a window reflects the sunlight and shines a rainbow onto the wall. Chameleon skin is filled with these tiny crystals and when they move their skin by relaxing or tensing up their bodies the crystals shift and reflect light differently. The skin cells also swell and shrink so that they move closer and farther apart. Shorter wavelengths of light, such as blue, are reflected when skin is relaxed, and the iridophore cells are close to each other. Since chameleon skin also contains yellow pigments, the blue and yellow colors mix to create a color we often see in chameleons at rest - green. Longer wavelengths of light, including red and yellow, are reflected when skin cells are farther apart. Research also found that female chameleons have far fewer iridophore cells in their upper skin layer making males able to change color better than females. Blending into their environment is the top reason why chameleons will change colors so that they can camouflage themselves and escape predators. But camouflage isn't the only reason to alter an appearance. Scaring away rival chameleons, impressing mates, stress, conserving heat and staying cool are all potential reasons for dramatic color changes. Chameleons brought into seeing the vet may turn dark colors or black due to stress, while happy and relaxed chameleons will be bright green and blue at home. Some chameleons can turn more colors than others, but all chameleons possess some amount of iridophore cells in their skin. Chameleons, like many other pet lizards, are amazing creatures!